Also known as Sweet root, Sweetwood. A hardy perrenial growing up to 1.2m with a spread of nearly 1m. It has feathery leaves and white or pale blue flowers followed by long pods. Useful as an anti-inflammatory and a decongestant in respiratory tract infections. 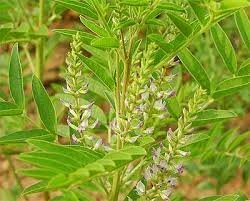 It has long been used for th relief of cough, colds and bronchitis. It is said to be effective in the treatment of intestinal irritations such as ulcers, and irritable bowel syndrome. Also used as a laxative. The root is used to flavour black treacle and some stout beers. 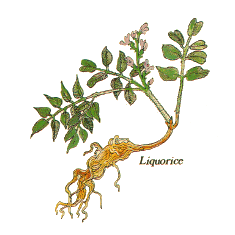 Liquorice had been prescribed by physicians since ancient times. The Greeks recommended it for cases of dropsy (oedema), to prevent thirst and for dry coughs and asthma. In 1305 Edward 1 taxed liquorice imports to pay for repairs of london Bridge. The populay sweets-Liquorice Allsorts- appeared in 1899 after Wilkinson, a maker of Pontefract cakes was taken over.